A first-hand account of the war between Sparta and Athens from a man dubbed the 'father of scientific history', Thucydides History of The Peloponnesian War is translated from the Greek by Rex Warner with an introduction and notes by M.I. Finley in Penguin Classics. 'My work is not a piece of writing designed to meet the taste of an immediate public, but was done to last for ever'Written four hundred years before the birth of Christ, this detailed contemporary account of the long life-and-death struggle between Peloponnesian League (led by Sparta) and the Delian League (led by Athens) stands an excellent chance of fulfilling its author's ambitious claim. Thucydides himself was an Athenian and achieved the rank of general in the earlier stages of the war. He applied thereafter a passion for accuracy and a contempt for myth and romance in compiling this factual record of a disastrous conflict. Thucydides (c.460-400 BC), Greek historian and author, took a small part in the Peloponnesian War when it broke out in 431BC. 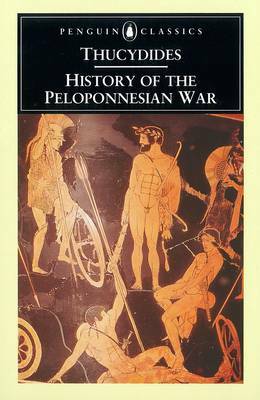 His account The Peoloponnesian War is the only surviving source for much of the period that he describes. Some of the chronological inconsistencies have been the cause of controversy among scholars for centuries.If you enjoyed History of the Peloponnesian War, you might like Suetonius' The Twelve Caesars, also available in Penguin Classics.